Close to Mesa Verde Park!! Nice grounds with an area for walking fido. The restrooms were spotless and the showers were great!! The park managers are warm and hospitable and have good knowledge of the area. We ate 2 meals at a restaurant they recommended! WiFi was good! First, let me say that I recommend this RV park. We loved it. It is very close to Mesa Verde National Park. Like, 2 minutes. This was great since this was how we planned to spend our time in the area. Positives: 1. The sites are mostly level. Have seen much, much worse. No leveling blocks needed for our jacks. Big plus. 2. Most sites are shaded by trees. However, this did cause a few problems with our awning. But we got over it quickly. 3. Nice Pool - although lots of kids. Which means it's a nice pool. 4. Great bathrooms and showers - we checked them out, but didn't use them. 5. Staff was very friendly and helpful. Really enjoyed just shooting the breeze. 6. Clean, clean, clean - love that in a park 7. Laundry room was great. Again, didn't use, but plenty of machines humming away. Negatives 1. Internet - WiFi in the back of the park was non-existent. If we walked up near the office, we could get on the internet, but a few spaces away, good luck. We really didn't need it much accept to do some trip planning. Disappointing to say the least. 2. Cell Service - non-existent. Not the fault of the park, but with no WiFi, this made finding information brutal. 3. Tight spaces - close proximity. While there are big rigs and plenty of them, the ally's were a bit tight for my taste. Only running a 31' rig, But made it work. 4. Sparse general store - More then some places I've been, but slim pickin's. Would I stay there again? Yes, if I was in the area, it would be my first choice. This place is definitely NOT a 10! We have stayed in so many better places with lower ratings. Reasons why this is not a 10: no grass, my table was under the neighbors pop out. No cable. Wi-fi is frustrating at best. Road noise. Some staff members are ornery. No dog park. The place is average, just surprised by the 10 rating, we expected so much more. Very friendly staff. Excellent access to Mesa Verde park entrance. You are about 7 miles from downtown Mancos. Very clean and spacious parking. All gravel but no dust. Off the highway but quite. Would stay here again. Great stay if you are visiting Mesa Verde. Park is 1/2 mile from the entrance. Staff friendly. We were able to get military discount even though my ID was stolen. Pull throughs are BIG! & have a great view of field & hills. Large (off leash) area for dogs to romp. Other RV sites in trees look nice as well. Big rig friendly. We stayed 2 nights. Fair pricing. Only ding is that sites are on gravel but level & no dust. We would come back again if in the area. Friendly, clean, very well-maintained. Nice shady sites. Virtually across the road from Mesa Verde, close to Canyons of the Ancients and Ute Mountain. The reasons for not giving them a top rating were only the traffic noise all night long, and the limited store hours. Most campers aren't 8 to 5 people. stayed at this park due to the rating and I was not impressed. I have a big rig and they only had 6 sites that I could fit in but I was put in a site so unleveled my back tires didn't touch the ground when my automatic jacks finished. I should have been told they had no more sites for something this big instead of letting me book it. The pool was closed and the Hot Tub smelled like sewer. The park is in a excellent place with great views but definitely not a 10/10/10. Everyone working there was very friendly and helpful so I don't blame them for the maintenance issues. I have traveled across the U.S. and this park is okay but should be rated a lot less. This an outstanding RV park. We arrived just after closing and found our site information and map taped to the door. Pull through 50 amp site, full hookups. We drove in and began to get leveled and within just a few minutes the evening custodian stopped by to help get us leveled by getting us right onto the coving of the site. I asked about paying and he said not to worry, deal with it in the morning. Great guy. We were asked not to hook up to water as the temp was to be far below freezing. The next morning we drove early to Durango for the Narrow Gauge Railway (A must visit). We got back just at closing again, we hadn't paid yet. They said not to worry but they'd already shut down the register, drop back by in the morning. This I did. The second night we ran out of propane due to my own miscalculation. Again, excellent service. I was told to just drop off my bottles at the refill station and their guy would refill and return to the site. 15 minutes later, we have filled bottles. Laundry was clean and neat, driers could have dried a bit faster but they did the job. Our grandson enjoyed the playground with the other kids. The park is only 1/2 mile from Mesa Verde, very nice, informative, modern, not too cheesy. Can't recommend this park higher. We will DEFINATELY be back. Oh, and there's a gun store just outside of Cortez with everything a traveler would want but can't get back home. Friendly staff. Really clean restrooms with great water pressure and hot water in shower. Nice laundry room facility with sink for washing clothes and tables to sit at or fold laundry. Small, well equipped store, and free movie DVDs available to sign out and bring back on the honor system. Only a few miles from either Cortez with lots of stores to shop at, and Mancos, that had its balloon festival with entertainment and market in a very pretty town core. In the RV park, the pool was nice but a bit chilly, maybe because it was near the end of September? We were lucky enough to get level in our spot with almost no trouble. We don't carry blocks or have leveling jacks so always a plus when we get level easily. Our neighbors were not as fortunate and spent at least an hour trying to get their trailer level. WiFi was excellent if you were close to the office but not great at all in our campsite. The area was green and the landscape surrounding us was beautiful. The park got full with a Winnebago group but it was quiet and everyone was very friendly. A nice place to stay if visiting Mesa Verde a truly awesome national park. The RV park is all gravel, but well kept. The spaces are not totally level, but need some blocks to be level. The hookups worked well and the power is steady. The bathrooms are sparkling clean. The hosts are great and have a lot of info for you. 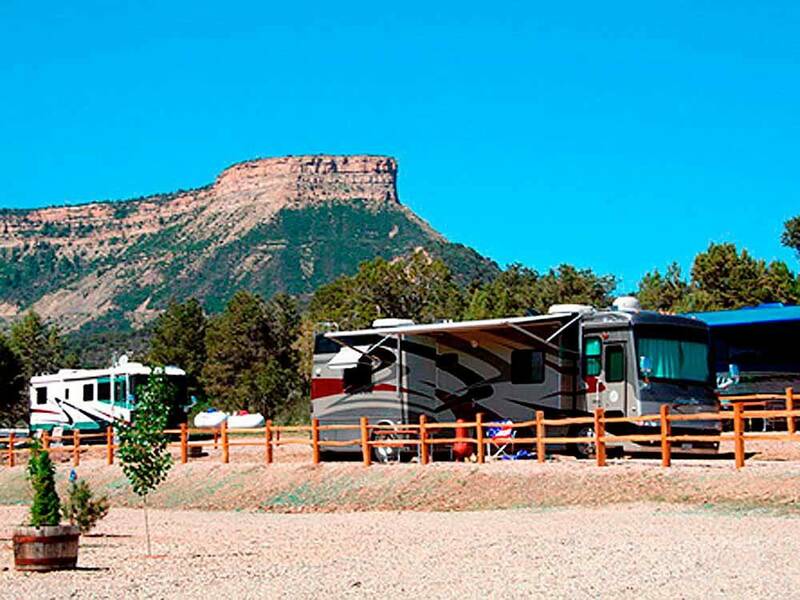 A great park to stay for your visit to the Mesa Verde National Park across the highway bridge. This is a nice park in a beautiful setting and close to Mesa Verde N P. The first thing you are told in the office and by the person who takes you to your site is that "we are only one of two 10-10-10 rated parks in Colorado". OK, fine. Sites are gravel and dusty. And among the worst we have seen in our over 15 years of traveling. Ours sloped back to front and two blocks to almost level it side do side. We are told to pull to the front for most level. Guess what I find out? The sewer connection is all the way to the back and very few carry 30-40 feet of sewer hose. We opted to not hook up for our stay and back up and dump when we left. We used their spotless bathroom facilities. Most of the sewer hookups were at the rear and far away from water and electric. However, our neighbor's water hookup was a pipe sticking up about three feet in the air well over into our site. His electric was at the normal post place and his sewer at the back. Both people who used it while we were there had a heck of a time. Don't get me wrong; this is a nice place but you should inquire about hookups and level of spaces - all will be dusty however. The 10-10-10 rating is not deserved. Thank you for your review. We are pleased that you enjoyed your stay.